How to get there: From Denver, take Interstate I-70 west. Exit on Hwy. 9 towards Breckenridge in Frisco. Frisco is a small village just up the hill from Silverthorne, the place at the bottom of the big downhill from the Eisenhower tunnel. Drive through Breckenridge and continue to Hoosier Pass, elevation 3517 meter. Continue downhill, locate the second drainage crossing the road from your left. This is roughly 1.7 miles (2.7 km) from the Hoosier Pass and after the 75 mile post on the road. There is plenty space for parking off the road. This is the trailhead, location N39:20.081, W106:03.078, elevation approximately 3340 meter. Route description: Follow the creek uphill. In late winter, there was less snow up along the left side. As you get to about 3650 meter, cross right and hike up to the shallow saddle north-east of point 3786 (12420 feet). The mountain is now right across a distinct valley. Turn more east and follow the powerline in order to reach the foot of the very distinct ridge that slopes down in a north-east direction. The location of this point is N39:20.751, W106:01.646, and elevation is approximately 3637 meter, You descend about 60 meter (200 feet) along this stretch. Climb the fairly gentle ridge to the top. 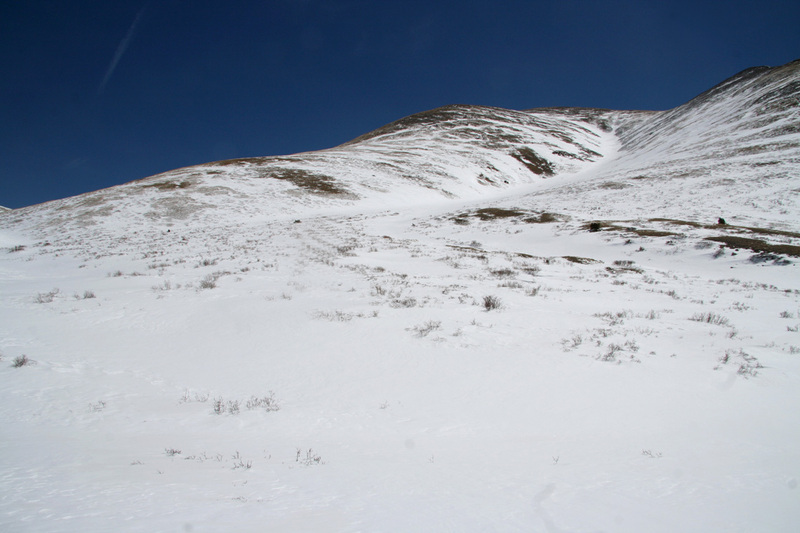 Mount Silverheels is now located further east, this final climb is very gentle. Comments: The family (Pål Jørgen (18), Tor Erling (25), Heidi and me) spent Easter 2007 in Copper Mountain, Colorado. 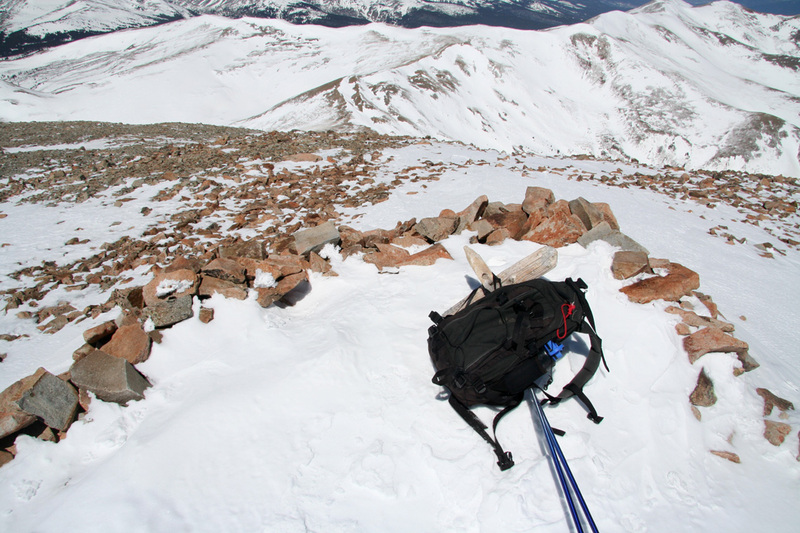 We all did alpine skiing, however the temptation to do a little wilderness skiing made me climb two summits as well. 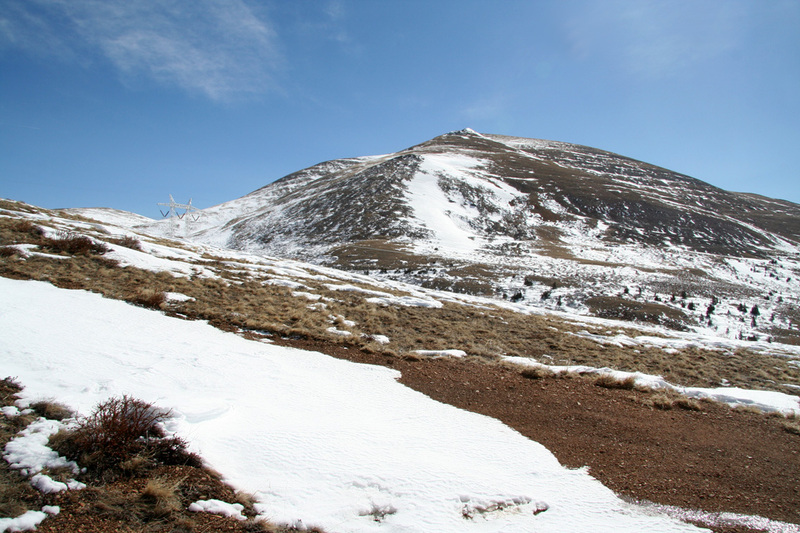 Mount Silverheels got its somewhat unusual name in memory of a dance girl that, as the only woman left in a mining community hit by an epedemic, gave care and help to the striken miners. I climbed this moutain solo. The weather looked reasonable, however windy. The local forecast called for wind at 55 mph (which is roughly 25 m/s). My plan was to ski, I had brought my backcountry skis with me from Norway. However, as I looked towards the mountain when driving across Hoosier Pass, it seemed clear that skis might be more of a problem than help. Thus, I set out on foot up along the creek that came down to the trailhead. 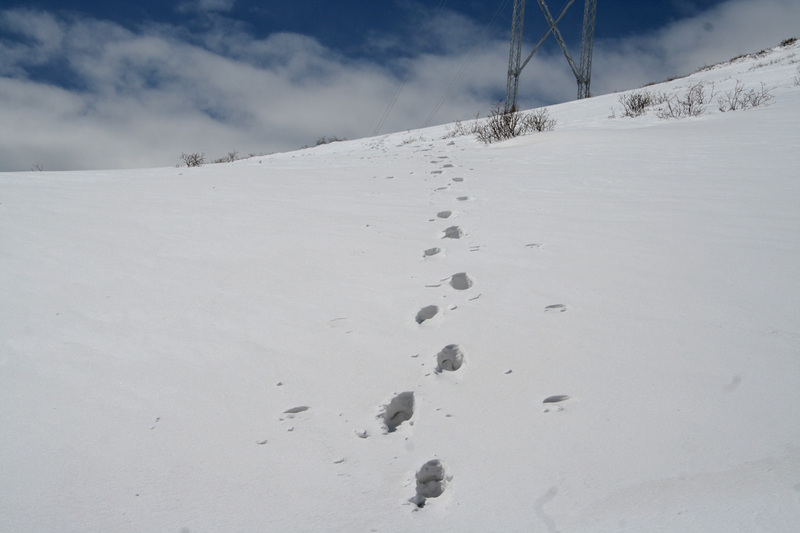 The challenge with this type of hike is to avoid sections with snow that do not support your walking. Also, one should think about the return hike. The snow may carry you in the morning and then turn into a nightmare as you try to hike back later in the day. The left hand side of the creek was mostly free of snow, I checked the conditions on the right side once, I immediately fell more than one meter through the snow. Thus, the left side was the only way. The slight problem with this was that my goal would require a transfer to the ridge up on the right sooner or later. Well, later was the answer for now. Higher up, the terrain and snow indeed looked much better and I hiked up and into the saddle from where I could see the bulky Silverheels right across. It looked OK to more or less follow a powerline in order to avoid loosing too much elevation. The snow was patchy and seemed to carry me reasonably well when a section needed to be crossed. Soon, I was at the beginning of the ridge leading upwards. From here on, skiing had been impossible, my decision to leave the skis was clearly correct. As I climbed higher, the wind became noticable, and then more. The summit had a wooden cross coming up from the snow. This was fortunate indeed, as I could secure my ski poles and my backpack to it. Even a loose ski pole would fly away with the wind. Visibility was good and the view from this summit outstanding. Since Silverheels is a bit isolated and is located near the eastern part of the Rocky Mountains, one gets a good view of many well known peaks. Photography was still difficult, the wind kept pushing me off balance and my right hand became ice cold without a protective glove. I had left the car around 0930 and arrived at the summit at 1215. As I got out of the wind back down at the base, a nice rest was called for. I had my first drink of water and sensed how this hike to 4200 meter really made me thirsty. Without the wind, I should have had some water earlier. I was back at the car around 1400, a nice trip without any sign of life aside from the ptarmigan that I saw higher up. Quite a contrast to the crowds at all the ski resorts and downhill slopes nearby. The next day, my friend Sverre came up from Lakewood (where he lives) and we all had two full days of alpine skiing. On Friday, I drove the boys to A-Basin, a nice high elevation ski area, then set out to climb Bald Mountain near Breckenridge. 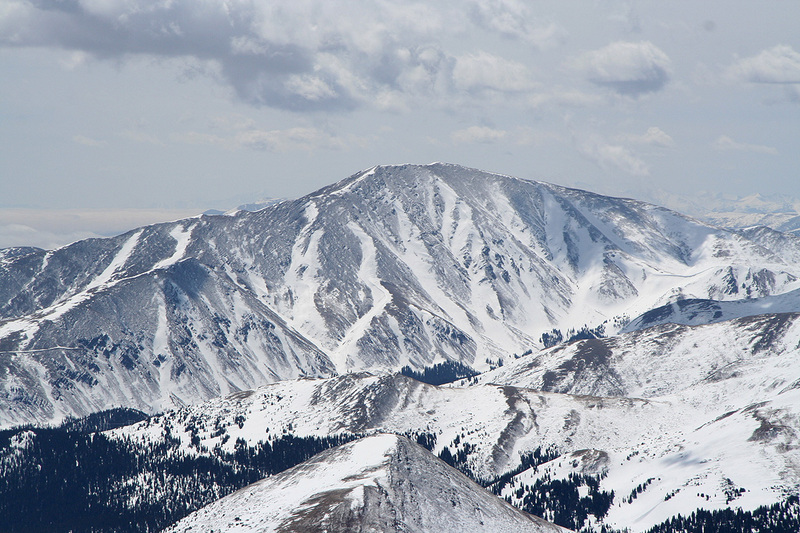 Mount Silverheels, as seen from the summit of Bald Mountain. Mount Silverheels, as seen from the first ridge. The summit is further behind. Snow section, walking was quite reasonable. The north ridge, my route ascended the leftmost ridge. It is slightly steeper than it looks. The summit. Ski poles and backpack have been attached to a wooden cross. Summit Panorama I. The view is from south-west, via west to north. Summit Panorama II. The view is from north, via east towards south. Summit Panorama III. The view is from south (Pikes Peak), to west (Mount Lincoln). Summit Panorama IV, zoom.The view is west. Mount Bross is dominating. Summit Panorama V, zoom.Continued from the previous picture. Quandary Peak dominates. Summit Panorama VI, zoom.Further north, Grays and Torreys. Summit View,a closer view south.